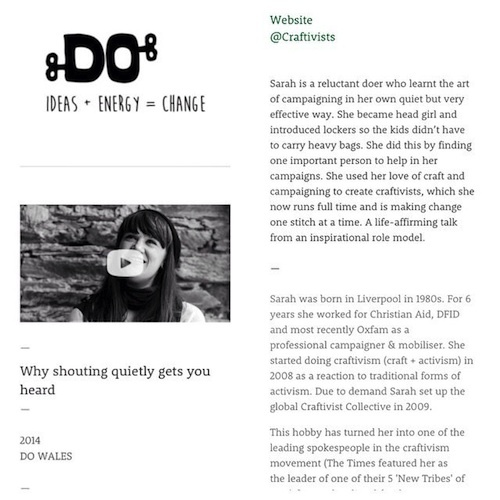 I’ve been a fan of the Do Lectures for the last few years so when I was asked to speak at this years Wales event I was super-excited but also terrified. The event is an intimate affair for around 100 people in a farm in Cardigan, Wales for 3 days. They hand pick 20 speakers from around the world to attend the 3 day event and talk about their journey of doing with the hope that they will inspire the attendees and people who watch the film online to DO good in our world using whatever talents and passions you have. I often watch their filmed talks online whilst I’m making our craftivism kits because the talks are so honest, show people’s journeys, passions, learning from mistakes, their fears & vulnerabilities but their stubbornness to keep striving to make the world a better place for everyone. The Do Lectures was asked to give a talk in I’ve never done before so I decided to talk through my steps as a doer to show that anyone can make a difference. A reluctant doer – nervous to take hold of to the opportunity put in my way to represent my fellow school students as Head Girl but rising to the challenge. An angry doer – angry that Primark was opening a massive store in Liverpool one summer but no one was going to be outside to remind people of the harm Primark do to the planet through fast fashion, not paying their garment workers a living wage etc so I felt I had to do something. A doubting doer – doubting traditional campaign methods and new forms labelled as clicktivism and slacktivism. Stubborn doer – not wanting to give up on fighting injustice and striving to help make the world a better place but not knowing what to do. A quiet & gentle doer – quietly figuring out how I could use the meditative and aesthetic qualities of craft in activism and create activism methods that could be more engaging to people where traditional forms didn’t seem to work. 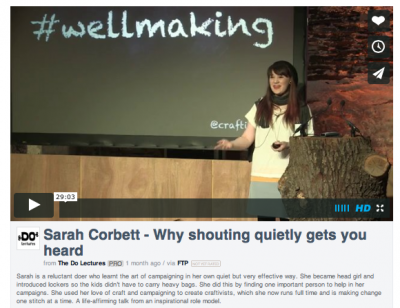 A accidental doer – lots of people wanted to join in my craftivism projects so I accidentally ended up creating and leading the Craftivist Collective. My Do Lecture 2014 talk – I was soooo scared!